Q: According to reports, sources said that the ROK Defense Department will seek to have its 2018 defense white paper due to be released next January stop referencing the DPRK regime and DPRK army as an enemy to the ROK. What is your comment? A: I have also noted relevant reports. Recently, the DPRK and the ROK have been making joint efforts to actively implement the consensus reached during their leaders' meeting and act on the spirit of the Panmunjom Declaration and the Pyongyang Joint Declaration to advance reconciliation and cooperation. A series of positive progress have been made. I noted that just now, the opening ceremony was successfully held to reconnect rail and road links along the DPRK-ROK border, which is good news for the two sides and is of positive significance to the peace process on the Korean Peninsula. We support the efforts the two sides have made to consolidate the current sound momentum by stepping up interactions, demonstrate goodwill to each other, solidify mutual trust, and improve relations. We believe that this will help advance the political settlement process of the Korean Peninsula issue and serve the common interests of the two sides and other regional countries. 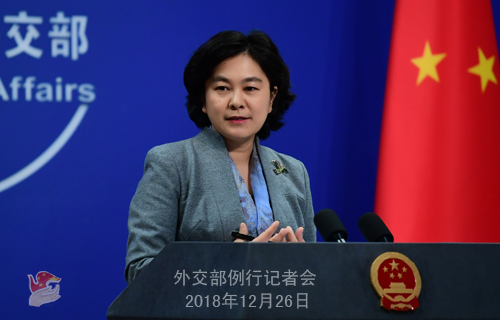 Q: It is reported that the first annual meeting of the China-Japan maritime and air liaison mechanism since its establishment in June is being held in Beijing from December 26 to 27. Can you confirm it and offer us more details? 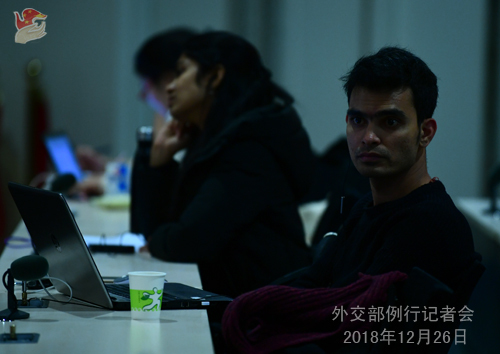 How does China view the progress this mechanism has made since its establishment? 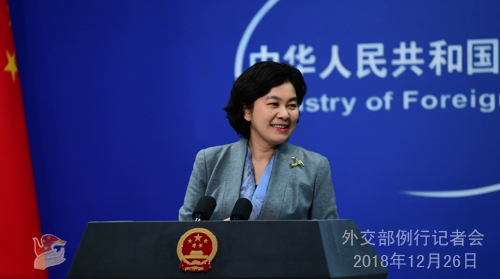 A: According to my information, the first annual meeting of the China-Japan maritime and air liaison mechanism between the defense departments of the two sides is being held in Beijing. As to the specifics, I would refer you to the Ministry of National Defense. When Premier Li Keqiang visited Japan in May this year, the two sides officially inked the memorandum of understanding on the maritime and air liaison mechanism between the defense departments of the two sides. This mechanism was officially launched in June this year. The establishment and launching of this mechanism will help the defense departments of the two countries enhance mutual understanding, strengthen mutual trust, avoid misapprehension and misjudgment and uphold peace and stability of the region. Q: Reports say that the Japanese side is considering sending Maritime Self-Defense Force (MSDF) vessels to visit China in April, 2019 and take part in the fleet review marking the 70th anniversary of the founding of the Chinese navy to be held in Qingdao. Japan may invite a Chinese warship to the MSDF's naval review to be held in autumn next year. What is your comment? A: Defense ties are an important part of China-Japan relations. This year marks the 40th anniversary of the signing of the Treaty of Peace and Friendship between China and Japan. The defense departments of the two sides enhancing exchanges and communication is conducive to properly managing differences, strengthening security and mutual trust, and building a constructive bilateral security relationship, thus injecting positive energy into the sustained improvement and long-term, sound and steady development of China-Japan relations. We welcome greater exchanges and communication between the defense departments of the two sides. With regard to the mutual visits of the Chinese and Japanese warships you mentioned, I would refer you to the Ministry of National Defense.